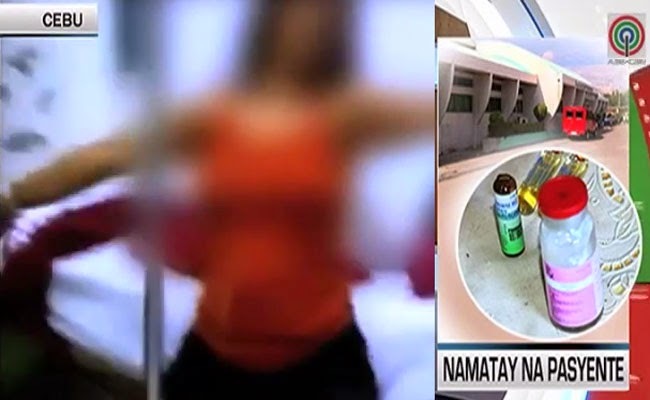 A woman in Mandaue City District Hospital died after a wrong medicine had been allegedly administrated by the nurses and the doctor. the victim’s husband is determined to file a case against them and the hospital. The devastated Ceasar Coliflores is an OFW who went home after hearing news that his wife , Jocelyn had passed away in Mandaue City District Hospital due to alleged negligence of the hospital staff. The victim went to the hospital with the chief complaints of high grade fever. On Facebook, a video of Jocelyn had went viral. She was seen in the ward throwing fits after the medicines had been injected to her. According to the family as reported in ABSCBN News, 750 mg of powdered Cefuroxime was mixed with Jocelyn’s dextrose which flows directly to her veins. Hospital staff had explained that Cefuroxime had been administered to fight the sensitive bacteria in the patient’s body. She was also given Diphenhydramine was also given to keep the patient calm but after 10 minutes, she had died. In the death certificate, the final diagnosis was Probable Raptured Cerebral Aneurysm, a case in which a blood vessel in the brain had raptured causing death. On the other hand, the PNP Crime lab came up with a different diagnosis saying that it was Sudden Cardiac Death and Left Ventricular Hypertrophy which caused the victim’s death. Ceasar Coliflores is determined to file a case of homicide against his wife’s nurses and doctor. The hospital administration stood their ground saying that the staff did not do anything against the law nor the protocol. They had appointed a team to investigate the incident. Coliflores’ lawyer says that they are considering filing administrative cases. Cefuroxime is a second generation antibiotic less potent than those in higer generation while Diphenhydramine is an antihistamine that can induce drowsiness and might use to calm a patient.